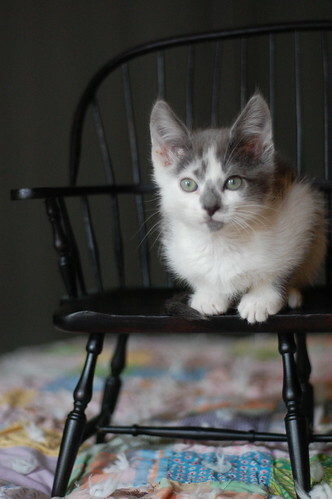 The Itty Bitty Kitty Committee: Kittens, Have a Seat. Looking good kittens! So yesterday's cage turned out to be the back of the chair. I knew Wiley was too cute to be doing time! Oh what adorable kittens. Wish I could have all three of you. Oh my! How did I not notice how BRIGHT Sylvie's eyes are until now? What a gorgeous little lady! How do you do it? Fantastic pictures - especially love the ones of Cecil - foot down and then the tail wrap in the next one. Love the tail wrap. 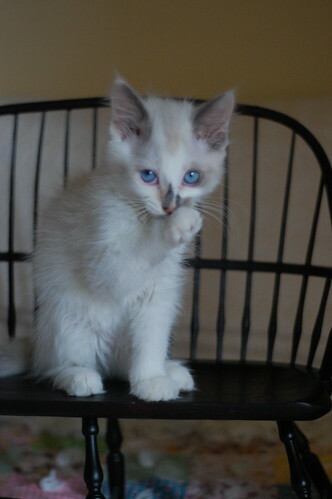 Sylvie's expression is so very intense, and I LOVE how it looks like she is trying to tell us a secret in her 2nd photo! I have this same chair! :3 Good to know it is kitten approved. 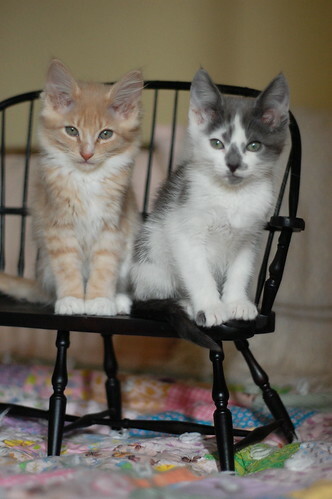 These kitties are naturals when it comes to posing in a special chair. Super photos!!! I think Sylvie is Up To Something. itty bitty kitties in itty bitty chairs! 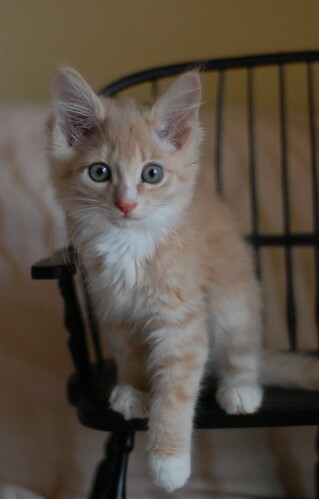 I don't know how you manage to take such great photos knowing how kittens are always on the move! holey moley, these kittens are soooooo adorable! I squeeee ever time I see them! OMDSL! These are the cutest little Knapps in the world! I wish that Sylvie could be my baby girl. Those blue eyes are just killing me! Your new camera is divine!!! Great investment and just too cute!!! Aw, that is just adorable. Each and every one of them needs multiple kisses on those noses! Love the kitten size furniture. 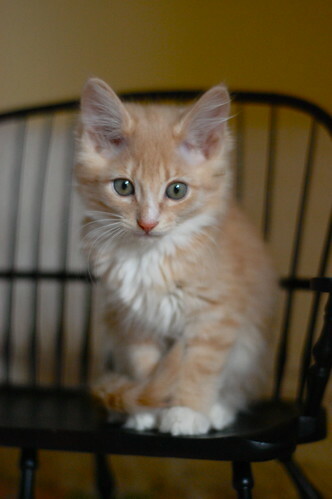 And love the kittens in 'em even more! These have to be the three cutest kittens on the face of the earth. Seriously. 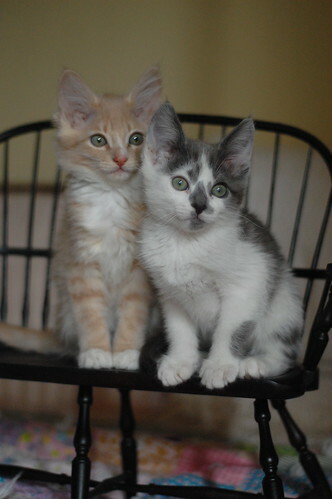 I love how these kittens look surprised or contemplative, but never sad. They're just sweethearts, and you can tell that as cute as they are now, they're going to be gorgeous when they're big. Where did you get that chair??? Wow there's something amazingly beautiful about each one. 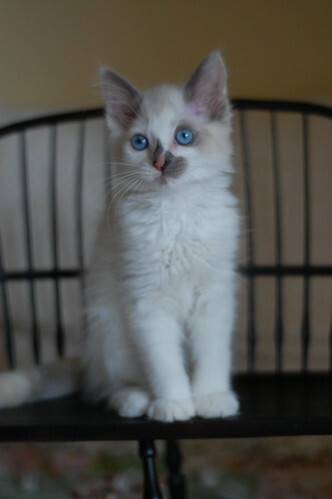 Wiley's one grey toe and personality, Sylvie's bright blue eyes and Cecil's creamsicle floof. Is it me, or are Sylvie's ear points coming in darker?